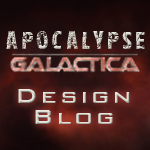 Welcome to Apocalypse Galactica, a Battlestar Galactica Hack of Apocalypse World. Watching the show filled me with a sense of awe at their constant desperation and refusal to surrender to forces they could not possibly combat. That was the world I wanted to play in! Apocalypse Galactica is a work in progress hack that includes playbooks, a few rules changes, and two scenarios to get you started playing humans on the edge of extinction…or the cylons hunting them! To Play Apocalypse Galactica you need Apocalypse World, by D. Vincent Baker. Below find my development blog along with actual play reports of the game. Play-test feedback: Hamish Cameron, David Gallo, Jeff Pedersen, Paul Tevis, Josh Roby, Morgan Ellis, June Garcia, Michael Garcia, Jon Edwards, Matthew Klein, Dale Horstman, Mac Hume, Steve Locke, Jacob Creed, Andrew McDonnell, Courtney Burmann, Sean Schoonmaker, Meilin W, Sean Cambell, Kristin Vogel, Ezra Denney, Karen Twelves, Ralph Wolterbeek, Michael Garcia, Kristin Hayworth, Shaun Hayworth, Basil Benitz, Xander Matthews, Antonio Morton, Joeseph Harney, Jonathan Henry, Paolo Bosi, Jesse Thacker, Eric Ullman, Josh Curtis, Justin Evans, and Zach G.
The best adaptation of Apocalyspe World. So say we all! Got to play Apocalypse Galactica with a G+ Hangout group, and had a blast doing so – we’re definitely going to play again. And how did I not notice that before? Wow. I’ll fix it as soon as I get home to my photoshop. More importantly though, awesome. You guys have totally inspired me to get back to completing my revisions of the playbooks. You rock.